Students from Sri Lanka visiting Washington, D.C. to take part in Project Common Bond, a program put on by Tuesday’s Children, a U.S. non-profit organization that helps children whose families have suffered because of terrorism. Pictured with the students (L-R) are Ms. Thulani, chairperson, Defense Attache Brig. Gen. Vijitha Ravipriya, Esala Weerakoon, Deputy Chief of Mission (center), and Defense Attache Brig. Dudley Weeraman. Foxcroft School in Middleburg, Virginia, where the Sri Lankan students will take party in Project Common Bond. 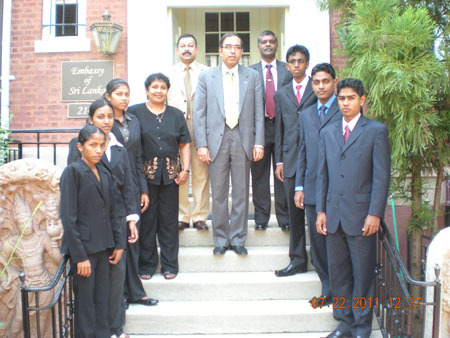 A group of six Sri Lankan students have traveled to the Washington, D.C. area this week to participate in Project Common Bond, a program devised by Tuesday’s Children, a U.S.-based initiative for children whose families have been affected by terrorism. The Sri Lankan students come from a variety of Sri Lankan communities, including Mallaitivu in the north, Gampaha, Colombo, Anuradhapura and Polgahawela. The students are aged 16 to 19 and will spend 12 days in the Washington, D.C. area, visiting the U.S. capital and taking part in a program at the Foxcroft School in Middleburg, Va., which sponsors Tuesday’s Children. Tuesday’s Children is a non-profit family service organization that has made a long term commitment to every individual impacted by the events of September 11, 2001, and more recently those who have been impacted by terrorist incidents worldwide. The visit is the first time Sri Lankans have taken part in a Tuesday’s Children program. The students, who were selected by the Ministry of Defense, include Shan Madusanka Hendavitharana of Colombo, Saffna Hanifdeen of Colombo, P P K Piyarathna of Anuradhapura, Dharmalingam Vadana of Mallaitivu, Akila Hansanie Weerakoon of Colombo and Prasad Premaratne of Polgahawela. Since 2001, Tuesday’s Children has promoted healing and recovery by strengthening family resilience, providing individual coping and life management skills and creating community through programs, mental health support and family engagement opportunities. While the program was originally established to aid children whose parents died in the Sept. 11, 2011 terrorist attacks in the U.S., it has since expanded to include children from other nations that have experienced terrorism. Project COMMON BOND takes place from Saturday, July 23 to Saturday, July 30, 2011 at Foxcroft School, Middleburg, VA near Washington, DC. The majestic campus complete with magnificent architecture was founded in 1914 encompassing 500 beautifully manicured acres in the horse countryside of Virginia just 50 miles from Washington, DC. The eight-day, interactive program features, skill building, communication, conflict negotiation and peace-building camp experiences. Participants will engage in a program designed by Harvard Law Negotiation and Mediation Program that fosters trust, cooperation, communication and transformation in the areas of global leadership, arts, theater, music and sports.